Tooth loss is no joke. Losing even one tooth changes how you look, eat and speak, and your self-confidence definitely takes a blow. Dr. L King Scott, dentist in West Monroe, understands these detrimental effects on oral function and appearance and offers leading edge dental implants to counter them. His implant patients literally get their smiles, and their normal lives back, when he places one, two or multiple implants to correct smile gaps or even to replace a full arch of teeth. Learn the details about this amazing restorative procedure. A single dental implant replaces an entire tooth from root to crown. A titanium implant device resembles a screw or cylinder, and it forms the foundation for this artificial tooth. Well-credentialed and experienced in the art and science of implant dentistry, Dr. Scott surgically places the titanium screw right into the patient’s jaw bone during a simple, in-office oral surgery. Over the ensuing weeks, the titanium screw melds to the jaw bone. This healing process is called osseointegration, and it is the secret behind the high success rate of dental implants. Osseointegration rebuilds the jaw bone which rapidly deteriorates after tooth loss. This is the biggest impact of dental implants because traditional prosthetics, such as fixed bridgework, simply rest on top of the jaw bone and do nothing to strengthen it. When an implant site has healed, Dr. Scott bonds a metal alloy post to the implant and a customized porcelain crown to the post. The resulting prosthetic looks, feels and functions like a natural tooth and is likely the last tooth replacement the patient will ever need. 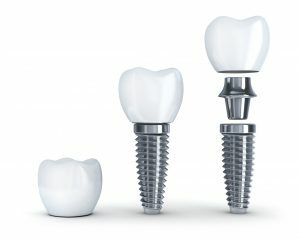 Dental implants also support multi-tooth bridgework and fixed dentures and so, are incredibly versatile. In fact, Dr. Scott may place a series of implants into a patient’s jaw to support a full denture. The ideal dental implant patient has adequate jaw bone to accept the titanium devices. Dr. Scott determines if an individual is a candidate through oral examination, digital X-rays, and other sophisticated imaging. Patients must also be in good overall health, too, and be diligent about at-home oral hygiene. Just as with natural teeth, dental implants must be brushed twice a day with a soft brush and flossed daily, too, to eliminate harmful plaque and tartar build-up. While dental implants cannot get cavities, they are subject to a destructive infection called peri-implantitis. Peri-implantitis resembles gum disease, destroying gum tissue and eroding the jaw bone. This infection threatens the security of dental implants and often necessitates their removal. Individuals who smoke are prone to this infection because of the toxins and temperature of cigarettes. contact L. King Scott DDS for your one-on-one implant dentistry consultation.